I wanted to like this so much more than I did, and it really disappoints me. The Red Pencil was on my Goodreads shelf for a year and a half before I actually got my hands on it. I thought I would fly through a novel in verse about a girl in Sudan. I was so excited to connect it to my students' reading of A Long Walk to Water. I thought it would be a great way to excite students about poetry. None of that happened, though. Amira is twelve years old when her village is attacked by the Janjaweed and she needs to flee to a refugee camp. 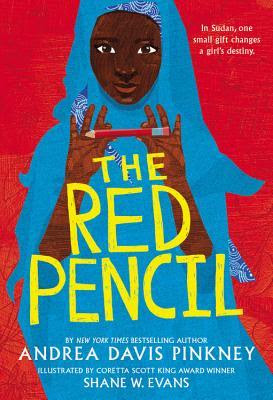 It is there (after about 60% of the book) that she is gifted a red pencil that allows her to hope for more: to be educated. Of course, that is easier said than done when you are in a war zone. I usually read novels in verse in a day, but I had to force myself to finish this book. I found the timeline unappealing: it took so long to get to the actual refugee camp and pencil, then I wanted to know more about what happened at the end. The beginning dragged out. If I struggled to read it, my students don't have a chance. I won't bother to book talk this one.